The political battle over the future of Universal Credit is heating up as the general election approaches, with the Conservative and Labour parties trading insults and accusations in an extraordinary exchange of letters. Shadow employment minister Stephen Timms wrote to secretary of state for work and pensions Iain Duncan Smith on 21 January 2015, after the latest Universal Credit update showed just 26,940 people were claiming the new benefit – less than 3% of Duncan Smith’s original forecast of one million people on the system by April 2014, according to Timms. In the letters, which have been seen by Computer Weekly, Timms cited “unnecessary secrecy”, “glacial progress” and “absurd” claims over project delivery. In his reply, sent on 22 January 2015, Duncan Smith (pictured) accused Labour of lying over its support for Universal Credit and criticised the party at length over IT failures during its time in government. The full text of both letters is published below. MPs have repeatedly criticised the DWP for a lack of transparency and a “culture of secrecy” over Universal Credit. Last week, Computer Weekly revealed that the full costs of the programme will not be published until after the election, despite DWP submitting its cost estimates to the Cabinet Office in September 2014. Labour has said it will pause the project if it wins the election, and conduct a three-month review of the plans. The party has consistently said it supports the concept of Universal Credit in principle, but has been critical of its implementation. 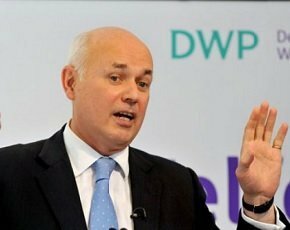 Duncan Smith has countered criticisms over delays and more than £130m of potential IT write-offs, stating he was right to take a cautious approach and change plans as the DWP learned from past progress. He has always said the benefits to the UK economy of introducing Universal Credit to replace the current benefits system would far outweigh any potential costs from delays and changes. A National Audit Office report in November 2014 concluded that it was too early to determine whether DWP would achieve value for money from Universal Credit. I write in relation to today’s Universal Credit statistics. By any yardstick, the project is still making glacial progress. Today’s figures show just 26,940 people claiming the new benefit, fewer than 3% of the one million people you forecast would be on it by April last year. The National Audit Office reports that £344m had been invested in Universal Credit IT up to 31 October 2014, but that the value of the assets created by that date was £125m – little more than a third of the sum invested. Waste on such a large scale reflects major errors, including adopting at the outset – as we warned – a hopelessly unrealistic plan. In 2011, you said that transition to Universal Credit would be complete by 2017, a date that was then six years away. Now we are told that the transition to Universal Credit will be complete by 2021 at the earliest – a date which is six years away. Expected completion has slipped four years in four years. We also hear worrying reports about poor liaison between department officials and local authorities affected by the roll-out, due to start next month. The wholly unnecessary secrecy with which the project has been shrouded has made matters worse, including your own absurd, oft-repeated claim that the project was “on track”. The NAO quotes wise advice to you from consultants that, “the department produce and publicise plans that include sufficient detail to confirm key activities and milestones”. Publication of such a clear and detailed plan would be a key output from our three-month review, should we be successful at the forthcoming general election. Do you now accept the case for greater frankness? Does it remain your expectation that 100,000 people will be on the Universal Credit caseload by May? Thank you for your letter of 21 January 2015. In that letter you make it clear to me that the Labour Party does not back Universal Credit, despite claims to the contrary. Equally, it shows me that the Labour Party has not learned the lessons of its massive IT failures; of the failures of the big-bang approach you took so disastrously with Tax Credits. The careful and controlled expansion of UC is the right approach: testing and learning and improving as we go. Given the widespread agreement that this is the right approach, and its endorsement from the Major Projects Authority that this is de-risking the programme, I am surprised the Labour Party continues to oppose this. As the permanent secretary has recently explained to the Public Accounts Committee, Universal Credit will save the taxpayer £7bn up to 2023-24. By any standards, £344m spent to deliver this is a good investment, particularly so in the field of welfare. These savings vastly outweigh the investment costs, both to date and for the rest of the programme. I am afraid a conversation of flat spend against that which is properly capitalised is not meaningful. We have already reduced the investment cost of this programme against the original expectation of £2.4bn by some £600m. Furthermore, the decision taken in Winter 2013, to use the assets already created whilst developing a digital solution, was estimated to save the taxpayer £2bn, compared with waiting for the digital solution. I make no apologies for changing our plans in the light of developments and putting claimants first, ensuring that we only move forward when we are sure of our ground. This is in stark contrast to the experience under the last Labour government of Tax Credits where the timetable was stuck to slavishly; leading to millions of people suffering over- and under-payments and billions of pounds of debt written off. My department has accepted all of the recommendations of the PAC and NAO. Our Strategic Outline Business Case covers the full lifetime of the UC programme and has been signed off by the Treasury and out plans assured by the Major Projects Authority, experts in delivery. Our plans are detailed, well thought through and developed on consultation with local authorities with visible milestones and have built-in contingencies. Indeed, the LGA (Local Government Association] is part of programme governance to ensure the views of LAs are fundamental to our delivery decisions. I have always been clear that Universal Credit is not a new IT system – it is a new welfare system. Universal Credit is about life change. We expect 3.2 million households will be better off by an average of £176 per month, up to 300,000 more people in work. Indeed, early results show UC claimants to more to find work [sic] and work more than JSA. UC is expected to deliver up to £35bn in economic benefits over a decade. Your continued opposition to this, despite your claims to support it, make it clear to me that you do not back Universal Credit, or the life change it offers for millions of people on benefits. From this letter it seems to me that you would rather we were keeping the Labour government’s botched system of Tax Credits and out-of-work benefits: a system where people were not better off in work, where people couldn’t take jobs for small numbers of hours, and where thousands of people in work found themselves owing hundreds of pounds in overpaid Tax Credits; £6bn overpaid in just the first three years of operation. I am confident in our future plans. By May, one in three Jobcentres will be live with UC. And the completion of national roll-out by the following Spring will see UC in all of Britain’s Jobcentres. It is worth reminding you that the last Labour government left us with a welfare bill which had grown by 60%, and Tax Credits alone cost over £170bn from 2003-2010. This government’s reforms are set to have saved £50bn by the end of this Parliament and got 1.75 million more people back into work. Labour’s record was by contrast one of waste and economic collapse, leaving [sic] to hardship for too many people across the United Kingdom.